With so much up in the air with the Canadian election, it would be foolish to speculate about its impact on Canadian foreign policy. So, let me speculate away. While some have wondered about Afghanistan and Libya, the most obvious and most certain impact will be felt when it comes to defense procurement. The F-35 is already in big trouble because the Harper government and the Department of National Defence have been far more optimistic than the Pentagon about what it will cost to buy and operate the new planes. That is usually hard to do--to provide estimates lower than the Pentagon and the defense contractors. If Harper wins a majority or minority, the F-35 will proceed. If an NDP/Liberal coalition comes into power, the F-35 will join canceled helicopter programs of the past (yes, there is no contract yet, but the plane is certainly planned, so being unplanned is close enough to being canceled for this one observer. Blame http://twitter.com/pmlagasse for this "clarification"). Neither the Liberals nor the NDP are big fans of the plane, and this is the starkest difference between them and the Conservatives and the clearest commonality between the two parties. Afghanistan? Not so clear. The Liberals were the ones who initially proposed a training mission to replace the combat mission. The NDP have been opposed to the entire Afghanistan project. If a coalition forms, this will be a key point of difference that will need to be finessed. My guess is that the NDP would settle for the currently planned training mission since it will NOT involve combat but will have steep caveats to prevent Canadian troops from being put at much risk. If the NDP gets into power, it will feel significant pressure to be a responsible NATO member, which means that cutting and running is not so likely. Of course, one compromise would be to put a stricter time limit on the training mission--2012 or 2013 rather than 2014. Libya? I doubt that much will change here. The mission is actually pretty uncontroversial with no casualties, few risks, and a Canadian serving as the operational leader. Plus it is the most R2P-ish thing that the Canadian Forces will be doing in the near future (unless one counts Afghanistan, which no one does). A Liberal/NDP coalition might still be Arctic obsessed, but would spend fewer $$ on planes and ships once they find that there are significant budget constraints facing them. The rest of the foreign policy menu has mostly been ignored in the campaign (at least by me), so I will be less foolish and not speculate so much about trade or climate change agreements. To be clear, there will be both more and less change with a new government than folks suggest. Holy Degrees of Freedom Problem, Batman! Or, how do we compare the not so nearly like? There is an obvious temptation to compare Libya to Syria and ponder why the US has not jumped into the fray now that Syria has started killing lots of people (to be fair, the piece does show how different the cases are). Now, I am not a Middle East expert (and I avoid playing one on TV), but this is a handy opportunity to think about how we do comparisons and then maybe we can figure out what is relevant here. In the first week of my big intro to International Relations class, I spend a bit of time explaining that there are few perfect comparisons in the world so that we must, indeed, compare apples and oranges. I go on to show how similar the two fruit are in nearly every way save one, and then I bite into the unpeeled orange. The point is to illustrate most similar comparisons and that we are always comparing apples and oranges. I then go on to compare an apple and a frisbee*--a most different comparison--where the two objects share few common properties but both can be thrown. I then compare Iraq to North Korea to suggest why one was, pardon the continued fruit obsession, low-hanging fruit. One key difference was oil, but that was not the only one then (or now). * Some have used apples vs wolverines as the alternative to apples and oranges but a frisbee is far safer in the classroom, not matter who end ends up catching with their face. As a result of doing this every year, I have now started looking at things like Libya and Syria and think: how comparable are these two cases? Is Syria more of an orange to Libya's apple or is it more frisbee-esque? The similarities are obvious: two Middle East countries where the dictators are responding to protest by using force. Asad does not have Qaddafi's fashion sense, but, otherwise, the two cases seem pretty similar. So, it seems that we have a most similar comparison, but there are several differences between the two cases, so it is hard to tell which ones matter the most (degrees of freedom problemo). Libya is far closer to the heart of Europe. Proximity matters not just in power project (which is what the realists would consider), but also in terms of migration project (what Kelly Greenhill would consider). The Europeans, especially the French, are far more energized about the Libyan situation than the Syrian one perhaps because their rising xenophobia makes any immigration politically dangerous. Libya was always very isolated from the rest of the Arab world. Indeed, Qaddafi has done a fine job over the years of alienating pretty much everyone in the region and beyond. We care more about Turkey's objections when it comes to a neighbor than when it was a distant Libya (same goes for Israel and other allies). Syria is AFTER Libya. That is, the US and its allies have finite capabilities, so there is less left on the shelf if one wanted to be more coercive. Plus, being AFTER also means that the costs and limitations of the Libyan effort make a Syrian intervention all that less attractive. Libya reminds us that this stuff is really hard. We can probably think of other differences (but again, I am not a specialist in this part of the world). The key here is that there are more differences than cases, so it is very hard to figure out which of these factors matters the most. One thing to keep in mind is that the US was not looking to intervene in Libya but was actively trying to avoid doing so. The Europeans got the US involved. Lacking that push this time and facing a far more complex environment, the US is likely to do less here. The NYT is making hay about the fact that Pakistan might be upset with Obama for appointing Petraeus to be head of the CIA. Why? Because Petraeus, in his position as COMISAF, has been unhappy that Pakistan has not been very helpful in the fight against the Haqqani network. Pakistanis may see his appointment as CIA director as a slight, but that would make them just a bit less narcisstic than I am. I am pretty sure that the CIA is not just about Pakistan. But more importantly, it is hard to see how such an appointment would worsen relations with Pakistan, given how abysmal they already are. I mean, my readers are normally big fans of Pakistan, yet most considered it to be the worst US ally in one of the most poorly designed surveys on the web. I do not know whether Obama took Pakistan's concerns into account when he chose Petraeus, but I would guess that he had other priorities than offending a country that is supporting folks who are killing American soldiers and marines. Yes, Pakistan has a few cards left to play, such as blocking the flow of supplies to the troops in Afghanistan, but then again so does the US. The two countries need each other and cannot stand each other. All I can say is that it is not going to get any easier or better in the near future. I have always felt like a member of the British royal family, and today really brings it home. I met a Katherine in college and eventually married her. So did Prince William. I could go on and on with the parallels, including my brief time in the British army, the fact that my grandmother keeps hogging the big title, and so on, but that would just take the spotlight off these happy kids. I sure hope someone is taking a few pictures of this wedding. Wouldn't want it to overlooked. Condi Rice has a short interview in the NYT. She still refuses to admit to any mistakes. Oy. So, here is a link to one of my old posts where I consider her to be the worst National Security Adviser in US history. As I tweeted today, the fun part is having Rumsfeld and Rice point figures at each other. Reminds me of how Rumsfeld's underling, Doug Feith, and Tommy Franks, who headed CENTCOM during the invasion, would accuse each other of being the dumbest mother@#$@#$ in government. Rummy is right that Rice was a horrible NSA. Why? In part because she could not manage the worst SecDef in history. Lots of people are pondering today the next set of National Security folks for Obama: Panetta as SecDef, replacing the retiring Gates, Petraeus at CIA to replace Panetta, and so on. So, my first thought right now is--these folks clearly are going to be better than the Bush crew. That is not saying much, of course. Folks would like an experienced administrator who is familiar with the intel process to head the CIA. How many of those do we have? Lots of worry that Petraeus's nomination is going to militarize the CIA. First, as many in the army would argue, Petraeus really is not like them. Plus he comes with an IR PhD (Princeton is known for having a decent program, I think). In his various positions, Petraeus has not only been a consumer of intelligence--using it to figure out what to do in Bosnia, Iraq in 2003, Iraq in 2007 and Afghanistan--but also a producer. J2! That is, in any military organization of any size, there is a section dedicated to gathering, analyzing, and synthesizing intel, including in SFOR in Bosnia, CENTCOM, his Iraq command, and at ISAF in Afghanistan. So, Petraeus has a great background for the job. Is this a way to sideline a potential Republican candidate at the same time? Maybe, but I doubt both that Petraeus has presidential ambitions and that the GOP would nominate someone like him (smart, open-minded, not a loon). Panetta? He only has experience within Congress, at the OMB, and at the CIA. So, he has not been doing defense stuff directly, but his new job will be one where the focus is very much on the $$$. He is better armed than most to figure out how and where to cut. Yes, he could be blunt and do something across the board, but I doubt that he is that dumb. Is he going to be as smart about strategy and selection of officers as Gates? Not so sure, but there are no ideal candidates. And the idea that Obama would give a good job to Lieberman who has proven he cannot be trusted is just laughable. Of course, people thought in early 2001 that Bush had picked a team of super-experts. Experts at making huge mistakes as it turns out. The proof will be in the pudding as they say (who? pudding addicts), so we will have to wait and see. These names had been floating for weeks, so there will be no surprises along the way. I have teased McGill students for being bad at math because they think they can get the education they expect without raising (or perhaps even lowering) tuition. Well, Texas puts other bad mathletes to shame: proposing a college education for just $10,000. That's right--four years of education for just a total of $10,000. Given that the average public university in Texas costs $6,500 per year in tuition, and the $10k figure is to include tuition, fees, and books, the proposal is essentially offering to reduce the cost of an education by 2/3's. How to do this? More online stuff, community colleges (have they been watching too much TV? ), accelerated and self-paced formats (holy contradiction in terms--would most folks be self-pacing fast or slow? ), and so forth. The best way to do this would be to increase state subsidies to universities, but how likely is that? Or, to borrow Marc Lynch's terms for policy solutions in the Middle East (Magic Democracy words), we can just use magic educational innovation words to cut the cost of a college degree in Texas by two-thirds. It is hard enough to keep the costs from rising, but to cut them by that much? I guess if all you want is a degree stamp and not an education, this should be pretty easy. Of course, like any good consumer product, the devil is in the details. What is excluded from the new Texas $10k degree? Check out the fine print: Does not include Math, Budgeting, Economics, Management, Public Policy, Accounting, Logic, etc. The funny thing is that money may not guarantee a high quality education with great outcomes, but we can be pretty certain that an absence of money is a guarantee of a sub-standard education. I wonder if these folks had basic econ: what happens when you depress the cost of something? Does it change the demand? Hmmmm. I guess I will spend $10k to find out, right? Today, I got in a nice twitter discussion about the latest academic embarrassment to hit the UK: the University of St. Andrews was taking money from the Syrians to fund their research centre. My tweet-friend, Stephanie Carvin, pointed out that the incentive structure in the UK is to max outside money, as this is highly rewarded in the competitive university review process. I cannot be that surprised that universities will compromise their values to take money. After all, I was at Texas Tech when the institution hired a known student-strangler in Bobby Knight because he would sell tickets. And, boy, did he! TTU won the gamble as Knight retired without incurring any new lawsuits. TTU just had to put up with 2.5 years of Knight's son coaching the basketball team. No, what bothers me just a bit is this: this past week's events are not the first time the Syrian government has been particularly oppressive. Sure, the government has not flattened one of its cities in a few decades, but if there was a fancy reclamation project of Syria's reputation a la Libya's, then I hadn't heard of it (nor did the academics who danced with the Libyan devil). So, St. Andrews may have the equivalent of buyer's remorse, having realized that they took dirty money, but to be provoked now only suggests that St. Andrews cares about the media spotlight and not the actual repression in Syria. After all, good social science means we cannot explain something that varies with a constant, and Syrian behavior has been consistent. What has changed, leading to St. Andrews revisiting its decisions, has been that Syria is now getting more attention for its latest crimes. So, I am not shocked really either by a school taking Syrian money or dumping it once the media turns the lights on. But I am annoyed that folks will act like they suddenly discovered they were taking cash from bad people. St. Andrews got caught. Now they can use the "I am sorry if anyone was offended" line or its equivalent. Yes, facing perverse incentives like the system in Britain might force one to make difficult choices, but facing a difficult choice does not mean being a weasel about it. Of course, I have gotten grants from the Canadian Department of National Defence and from NATO--two organizations that try really hard to kill people. And the media notices that I got money from these killers, will I return the money? No. I knew where the money was coming from and what those organizations are about. And I am ok with it, even if it hits the newspapers. Dan Drezner, in response to the idea that aspiring leaders should read Tom Friedman (could be worse, could be Robert Kaplan or Sam Huntington), has asked folks to suggest three books (or articles, I guess) that a President should read. The last time I checked his comment thread was chock full of books that no policy-maker will ever read. Stephanie Carvin has a good list, Brian Rathbun mocks the exercise, and there will be many others soon. I struggled with this, because most of my reading these days has not been too general but rather focused on things like Afghanistan, civil-military relations and the like. But I do have some ideas, including resisting some temptations. First, as we are seeing with Libya, countries may be more responsive to conflicts when there is a significant threat of producing refugees. This is not the first time, nor is it the last. And with the strengthening of anti-immigration forces around the world, it is important to understand these kinds of dynamics. Second, and more importantly, what Greenhill depicts in her book is the international equivalent of insurgency. The bad guys (Milosevic, etc) have realized that the democracies of the world do not like refugees but have values that make it hard to deal with them. So, creating migration crises is a weapon of the weak to use against the strong. Thus, this book is useful for explaining to leaders of advanced democracies how their potential adversaries are clever, how they fight an asymmetric conflict, and the traps that are out there for the big democracies. I simply see this kind of problem happening again and again, as weaker countries will not submit easily but instead convert their strong resolve into imaginative strategies that make it hard for the strong and the pure (relatively) to impose their will. The next temptation is to assign Thucydides or Morgenthau to teach prudence. Not going to happen--big books that are dusty. Instead, I would suggest Rajiv Chandrasekaren's Imperial Life in an Emerald City (Fiasco by Tom Ricks would also be good, but need shorter books for politicians). It is a great book that details many of the problems with the Coalition Provisional Authority (Can't Produce Anything) that "ran" Iraq after the invasion. Why? It clearly teaches the consequences of arrogance. The book is chock full of tales of people who thought they knew so much making dramatic and tragic mistakes. It shows how complex the aftermath of a major military effort can be--far more complex than the battle itself. In the book, each chapter is dedicated to a different element of the effort (water, power, markets, education, etc). It would give an aspiring leader pause before dropping bombs somewhere, as the next steps are the most important and difficult ones. Finally, I would be tempted to recommend Robert Gilpin's War and Change since it is just a great combination of security and economic stuff, a very fun realist that is subversively marxist, and ties together perceived and actual distributions of power. But again, it is older and perhaps too smart for today's politicians. So, instead I will simply recommend foreignpolicy.com. It has a nice blend of bloggers (especially Drezner, Ricks, and Lynch) that present sharp analyses, multiple points of view (which leaders need more than anything else), and the right dose of snark. Perhaps this last one is a dodge, as I have hard time thinking of a good book that blends international political economy and security in a digestible form. What do my readers suggest? We have not had a contest here in quite some time so it seems to me that we ought to have one. How about: who is the worst ally of the United States? Pakistan is apparently advising President Karzai of Afghanistan to dump the US and ally with Pakistan and China. And, yes, Pakistan is supposed to be a US ally, but with all of the conflict lately over drones, Pakistan's support of terrorism in India and insurgents in Afghanistan, US agents shooting people, etc, it seems like we may facing a parting of the ways. Especially if its leadership is trying to poach our supposed friends. On the other hand, Karzai has been undermining the US effort for years as part of his strategy to survive politically. Kind of makes the Iraqi leadership, which only wants American troops to leave, in large part due to public pressure, almost reliable. What defines the European Union? If one has to think about the EU and its quasi-state-ness, it is certainly not its common foreign policy. Each time, the EU confronts a major foreign policy crisis, the members realize they have un-identical interests. Is it about the Euro? Well, that is pretty recent and now pretty damaged. Ah, one core bit of EU identity would be this: that it is supposed to be BORDER-less. I truly enjoyed driving all over the Benelux countries a couple of months ago--from Belgium to Netherlands back to Belgium to Luxembourg to Belgium and then to France (Vimy) and then back to Belgium--without stopping at a customs line along the way. The question du jour is: will xenophobia trump this essential component of EU-ness? France and Italy, due to their desire to limit the flow of refugees from North Africa, are now raising questions about the heart of the single Europe enterprise. Is this surprising? Mais non! Am I taking too much delight in the relevance of xenophobia for 21st century Europe? Mais oui! I would argue that this presents perhaps more of a crisis for the EU than the Greece's/Iceland's/Ireland's financial messes. If the European countries start really start to enforce flows across their borders, that truly is a return to the past. The Euro can be seen as a hiccup, but preventing the flow of folks? That is a major reversal. But there is a way to avoid this mess--by relying on the essential meaning of the EU--no walls within, big walls without. If these countries can get the rest to be better at keeping out all of the troublesome folks who are fleeing oppression and violence, then there is no need for barriers between members of the organization. The good news is that xenophobia is widely shared within Europe, so I would guess the next step of EU development is not enlargement (more countries admitted) nor economic deepening, but a common effort to develop standards and policies and practices to keep out foreigners, especially the poor ones (and just perhaps from the predominantly Muslim countries). I wish I had a good term to parallel deepening and enlarging but wall-ifying sounds bad. Heightening? Vague. Hmm, more work on the new EU trend. Perhaps closing will do for now. Just to follow up on yesterday's post about the prison break, Graeme Smith reminds us that the real failure of counterinsurgency here is not at the prison but outside of it. Sure, some guards might have been bribed, but the key failure is that none of the folks in the neighborhood tipped off the government or the internationals. Such a significant operation would have probably been noticed by some of the locals in an area that had seen much investment and had been very much under the control of the government and ISAF. One of the recurring themes here at the Spew is that progress is best measured by information that we outside observers cannot really see--patterns in actionable intelligence tips from the people. Are people betting with their lives? Do they see the government and NATO as the best option in town? Or are they intimidated enough by the Taliban not to give the counter-insurgents the info they need? While there may be classified collections of data to suggest that the US/Canada/NATO/Afghan government is getting more and more good information to target the Taliban and detect roadside bombs and suicide bombers, clearly this prison break is one of those kinds of things that we would want to get info about beforehand. And we did not. I always say we have not been doing COIN for eight or nine years, so we have to have reduced expectations. BUT this is a hunk of land with which the government and the international community have had much interactions and even control for the past several years. Yet none of the locals warned the relevant folks. If COIN does not work in the heart of Kandahar City, how likely is it work out in the outer-lying areas of the province? Now, more than ever, it seems like a decent interval is all we can hope for. This one event (well, the second time) achieved its goal--of sucking all of the optimism about ISAF's latest efforts out of the country. The Taliban may be bad at governing and may be bad at marketing itself, but they do a mighty fine job of making the government and its allies look bad. As always, Afghanistan is the land of bad alternatives. Which one is the least bad now? Update: One addition: check out the debate in original Parliament. The Brits have style, I must say. Driving to and from my daughter's school this morning, I noticed a certain pattern among the various election posters: only one party in my area has posters not only of their local candidate but their party leader as well. Any guesses? Yes, Jack Layton. Only the NDP seem to have a leader that is seen as an asset to a local candidate. I guess Duceppe for the Bloc might also count in this category, as I have seen his face (does he remind anyone else of a ferret or is that just me? ), but it is clear that neither the Conservatives nor the Liberals (especially) consider their own leaders to be assets in my part of town and perhaps beyond. Lots of hysteria the past few days that the NDP is now second in the polls, that this might either facilitate a Conservative majority or an NDP-led coalition with the Liberals. Funny, I don't remember Layton being challenged about a possible coalition, just Ignatieff. So, Layton could perhaps lead such a coalition without appearing to be two-faced. I would not mind so much an NDP-led government, except I was persuaded by one op-ed that Layton's promises to re-open the Constitution question here would be a BAD idea. Canadians really do not want to tamper with the status quo, given the past disasters. Quebeckers probably do not want to think much about it, since it is the only issue that can really raise the spectre of a successful referendum. I guess a coalition government might put the brakes on such a promise. That and the reality of governing. Such an easy promise to make when no one thinks you have a chance. And that really is the key to the swing of the week--that the biggest constraint the NDP has had was the perception it was a wasted vote. Now, perceptions have changed--the NDP can possibly be more than a largely irrelevant third party. This has produced the same kind of cascade (to a much lesser degree) than one sees in revolutions (East Europe in 1989, Arab Spring this year) where suddenly people's preferences are revealed--that conditions have changed so that what they want, or more precisely, what they do not want (the Liberals) becomes clearer to themselves and everyone else. The "NDP is no longer a 3rd party" genie will be tough for Iggy and Harper to stuff back in the bottle. Iggy certainly would like to try, but I am not sure whether Harper will gain or benefit from the NDP's rise. Suddenly, a Canadian election has become, dare I say it, interesting! Next think you know, dictators in the Arab world will lose their positions. that the Taliban are not nearly as broken and disorganized as some would argue. The first prison break seemed to indicate that the whole "these guys cannot organize anything of significance" myth was perhaps a bit off. The second one clearly demonstrates that the Taliban, who spent months tunneling into the prison and found the right spot (GPS? ), are not a random band of idiots. that the Afghan government has made very little progress. This event happened three years after the last prison break with much international effort focused on this place. Prisons can be generators of extremism. Little did we know that that the Saraposa prison is more of a half-way house or bed and breakfast of extremism. The international focus on improving the treatment of prisoners did not apparently stretch to focus on retaining them. No tunnel prevention efforts? While it is easy to second guess now, given that (a) this prison was a target for previous organized escape efforts; and (b) tunnels are the classic way to escape a prison (Great Escape anyone? Shawshank much? ), one would think that there might have been some effort to detect tunneling. Of course, I lacked foresight. In my imagining of a new Hogan's Heroes, I thought about Gitmo, I thought about allied POWs somewhere in the mountains, but I did not consider the Taliban to be the tunnel rats of the 21st century. My bad. So, where does this leave us? Well, it undermines all of the claims made recently about progress. In two senses: it shows that the government is incredibly inept (shouldn't the escape have been discovered somewhere along the way as 475 guys start disappearing? ); and it tells the public that the Taliban are actually organized. Would you now bet with your life by siding with the government? Um, no. If COIN is about control, what does this event suggest? Not a good way to start the Spring fighting season unless one is a Taliban PR guy. Too much? 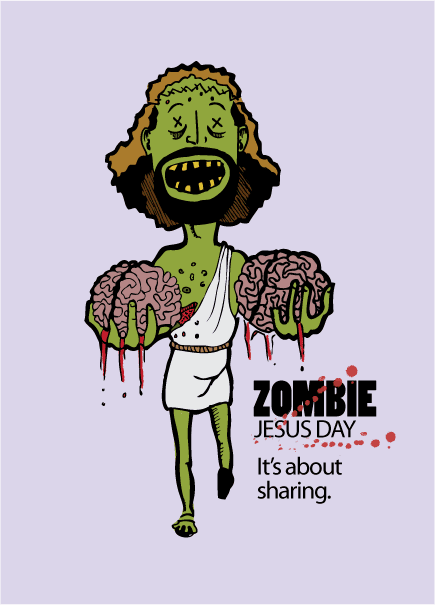 I just love the idea of a zombie willing to share brains. From this website. Lots of Z references this year online. Don't remember seeing any last year. I have been most surprised by the Euro crisis. I admit it. I simply, and completely out of character for me, took it for granted that the Euro zone would be significantly smaller than the EU. That is, I bought the initial line that only countries meeting the criteria would join the European Monetary Union, despite the fact that I wrote a book and an article (and heaps of blog posts) with much skepticism about conditionality and membership processes. Why did I have such a blind spot? Because I thought that German concerns about controlling the currency would be stronger than the desires for a pretty map with no holes in it. Stupid me. Well, really stupid Germans. So, are there any European specialists following this blog that can tell me what the hell happened? When and how did the EU toss aside the problems of extending the currency to countries that could not/would not keep their financial house in order? Now it seems to be the case that the Finns may stand in the way of new bailouts because a xenophobic and anti-EU party (True Finns) has done well in the latest election. So, the future of the Euro may hang on some wacky Finnish haters. Wow. I have blogged about those wacky Europeans before, but I have been promoted to do so again because of this story. A glass of wine, beer or cider – but not spirits – was always permitted with lunch, including while on duty. Even packed lunches provided out of riot vans while they were patrolling demonstrations came with a can of beer or glass of wine. Yes, the French riot police can no longer swill wine and/or beer during their lunch breaks. Sacrebleu! Quelle horreur! This reminds me of something I saw while I was traveling through the various US/NATO headquarters as part of my orientation during my year on the Bosnia desk of the Joint Staff. When we were in Sarajevo, we went to the headquarters of the NATO effort. While there, we had lunch at the cafeteria of the Italian Carabinieri. These are the special/paramilitary police who serve as an intermediate force between police and army. 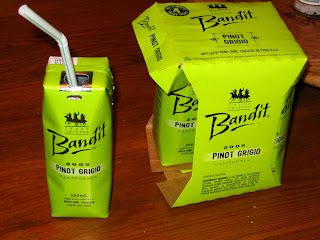 Anyhow, in their cafeteria, they had juice boxes like the kind kids have--but these did not have juice but wine. I never heard of such a thing, but to have it available where the paramilitary police guys lunch? Oh my! So, I cannot say I am surprised that the French riot police are used to drinking alcohol during their lunch hour or that they would be upset at losing this privilege. Are Canada's Liberals Weenies or Weasels? It might not matter since they are now third in the polls (but that might just be for today), but the Liberals in Canada tend to drive me crazy. While it makes sense for the NDP, which has always been consistent (more or less) in its criticism of the Afghanistan mission, the Liberals not only started it, they also proposed some sort of training mission follow up. So, to criticize Harper for doing exactly that is pretty strange. Yes, Canada is sticking around in Afghanistan, but the new mission is not going to be the old mission--it is not going to be combat. No wonder they are dropping in the polls. Of course, the NDP panders so much that they will inevitable alienate the pandered, but not quite yet. That Anglophones in Quebec might support the NDP is a sad statement of how low the Liberals have sunk, since the NDP is quite willing to sell out the English for French nationalist votes. * I made a mistake, but an understandable one--putting in the dead parrot sketch (which presents a lousy argument) when I wanted the sketch that reveals that mindless gainsaying is not an argument or an opposition for that matter. I snarkily responded to a tweet about the possible redeployment of armed drones from Afghanistan/Pakistan to use over/around Libya. And now I see that Obama has approved such "low density/high demand" assets for Libya. What this really shows is that the US does have finite means, as there are only fifty or so armed drones. This raises two questions. First, is Libya really that important compared to Afghanistan? Or do we control the airspace and ground enough in Afghanistan to rely on other means (blimps are all the rage these days)? Having the US/NATO stumble in Libya is significant, but this does raise an important issue about priorties. Second, what is really going on here is this: Obama is really trying to avoid increasing the US commitment, but is it a wise choice not to use other assets instead: A-10's and AC-130's, which are available? The problem is that the international effort in/over Libya needs platforms that can fly slow and stay in one place to detect mortars, rocket-propelled grenades and other more modest weapons that the Libyan forces are using against the rebels (and journalists). The Europeans do not seem to have much on the shelf that is good for this part of the campaign. The US does not want to take the lead/ownership of this, but the reluctance to use some of the appropriate although perhaps riskier assets means that we have to reduce some of the scarce resources that have been dedicated to Afghanistan. I understand that Obama is in a difficult position, but I am not sure that preventing the use of attack aircraft is the right choice. Yes, it reduces risks, but it also reduces effectiveness and imposes difficult tradeoffs. Of course, Obama faces an Eleanor Roosevelt problem--damned if he does, damned if he does not. No wonder his hair is getting grayer. Lots of blogging about Greg Mortenson's book, its flaws, and what it means for counter-insurgency. I have not read the book myself or even feel as if I read the book but not myself. What I will say is this--there is a lot of mis-understanding out there about COIN. The effort to get to know the area (which sounds Cups of Tea-ish) is fundamental to engaging in a war against an enemy that seeks to blend in with the locals. Having shuras and councils with the local elites makes sense, whether you buy the Tea or not, as these folks are the ones who have a clue about the area, know who the strangers are, and so on. COIN is not about hearts and minds, despite the slogan. It is about credibility and confidence--do the locals view the outsiders and the government has being reliable? Can they count on them for security? for the delivery of government services? for justice? Or do they have to rely on the insurgents or themselves? The surge in Iraq "worked" in that the locals found the extremists to be too violent and a greater threat. Having more troops on the ground made it possible for the US to seem more reliable than the alternative. People are betting with their lives, so it is not about love (hearts) or ideology (minds), but about fear and survival. The insurgents do not need to win the love of the locals, nor do the counter-insurgents. The battle is for control (a la Kalyvas). This does involve indeed a fair amount of "kinetic" warfare--shooting, killing, and such. COIN is not about handing out candy bars, but showing that you can stick around and thwart the other side, including killing them. But it works best if one is discriminate in the use of force--only killing the insurgents. Indiscriminate force is not only immoral but counter-productive. This is where the locals are so crucial--helping to identify the insurgents. Of course, the problem is that they have multiple motives (he stole my goat, that guy hit on my girlfriend, this dude cheated me out of my savings, whatever), so the outsiders/government need to be discerning so that they do not get played. Anyhow, COIN, like all war, is politics by other means. The politics amidst the COIN is more obvious than the politics amidst a tank campaign, but the choices made in either can have significant ramifications beyond the immediate battle. The key thing about COIN is that there is no simple solution, no single way to handle everything. It requires the ability to adapt and adapt faster than the other side. The Cups of Tea stuff with schools and the soft side of power has its role to play, but reading that book, whether it is fatally flawed or not, really did not handicap the war effort. Petraeus, a noted fan of the book, has made the campaign in Afghanistan more violent than his predecessor, including allowing some folks to destroy villages in order to save the country a la Vietnam. See this excellent piece by Rajiv Chandrasekaran (who wrote a great book I did read, Imperial Life in an Emerald City about the Iraq war). So, the folks who like to bang heads and are critical of COIN for being soft and squishy are, well, talking out of their asses. I am not a COIN expert, but I can see that the campaign has been violent and will remain so. I have my doubts about it working because it ultimately depends not so much on American/NATO reliability and credibility but that of the Afghanistan government. Oops, indeed. Yesterday, I blogged about different kinds of sauces for different kinds of effects. Well, today, we do not need any, as the events du jour have provided enough of a wake up call: the deaths of several journalists in Libya, including one of the guys behind Restrepo: Tim Hetherington. Already, some twitters are reminding us that non-western, non-famous journalists have been dying in these kinds of conflicts for years. Still, having a face and a name that resonates reminds us that these journalists who cover war are very, very brave. Perhaps foolish, but they are needed so that we can get some idea of what these conflicts look like and what is actually going on. I honestly don't know how they keep doing it, but following the tweets of CJ Chivers of the NYT has been astonishing, moving and unforgettable. These folks do not get enough credit. I have been very critical of the media over the past few years of blogging here, so I should acknowledge how crucial these folks are. What is Sauce for the Goose? A review of the recent Parks and Rec reminded me of one of the running gags in my blog: sauces. Then there is denial sauce. The idea is to ignore the existing reality by denying it or by comparing it only to a selective slice of reality. Canadians comparing their health care system to the American one without seriously considering the alternatives existing elsewhere (do they have health care in Europe, perchance?). A relatively new addition to my collection of sauces is perspective sauce. That is when the world reminds us that there are bigger issues out there than the small petty grievances of whiny academics like myself. And now, thanks to Parks and Recreation: awesome sauce. Actually, as the link suggests, the phrase predates last week's episode of Parks and Rec by a good bit: the definition is "The invisible substance emitted by anything awesome. Inherently making itself, and anything it covers, awesome." I think this makes a terrific four-pack: they vary in flavor from tasteless (secret) to somewhat bitter (perspective) to sickly sweet (denial) to chocolate chip (awesome). * In this four-pack, you have sauces for many occasions and uses--positive (awesome sauce) negative (denial), and mixed effects (secret, perspective). * Perhaps awesome sauce varies in taste to fit the taster. To me, awesome sauce usually tastes like chocolate chip coolies, but sometimes tastes like cinnamon buns. I guess the next step is to find some graphics to put on the labels. Of course, I not only volunteer my readers to provide such graphics since I can only imagine sauces and not their art, but I also ask the readers whether there are other sauces that I should add to the selection. What say you? Ok, to be true to ER, the rest of the quote is: "You'll be damned if you do, and damned if you don't." “The important thing now is that the sense of abandonment that was in the air last year is gone now,” he (a Karzai adviser) said. So, the Russians are upset that there might be long term bases. Well, just as there will not be significant long-term bases in Iraq (where US interests are far more important), the US is unlikely to hang around just for the privilege of eating dust. The general momentum in US defense planning is towards the reduction of deployments abroad. Yes, there are still troops in Germany and Korea many decades later, but anyone who wants to keep making analogies between Iraq and Afghanistan on one hand and Germany and Korea on the other left the US government with the rest of the neo-cons. The US never really enjoyed the Great Game, as it is called. The US only got involved to punish the Soviets and then again when Bin Laden used Afghanistan as a base of operations. Does the US really want to be in between Uzbekistan and Pakistan? Not so much. Dealing with the threats emanating out of Pakistan are complex enough that bases in Afghanistan are useful, but they are not the difference between success and failure. In Afghanistan, as in Iraq, domestic politics will limit how much American presence will be acceptable. There will be a need after 2014 for American advisers (and those funding the Afghan government) to be located in Afghanistan. But US budget politics and increased frustration with Afghanistan will almost certainly mean a declining presence over the long term. Going back to Eleanor: we are damned if we do and damned if we do not. The US got heaps of retrospective blame for what happened to Afghanistan in the 1990s for leaving it to the Afghans. The US is getting heaps of concern now for thinking about keeping an eye on things after 2014. We need to care about what others think (unlike what Eleanor and my daughter suggest) since any strategic situation means that the outcomes depend not only on what we do but what the others do. But we need to figure out which "least bad" policy is the best one, and not be deterred by the anxieties of others if that is what it takes. There can only be one HP movie left. Go here for a bit of the trailer and then a key early scene with Mr. Ollivander. I think that ends my longest streak of non-HP-ness in quite some time. Military folks are surprisingly well read. We academics tend to think of folks in the military as knuckle-dragging neanderthals, but they almost surely, on average, have read more stuff than civilians, especially non-academic ones. They tend to have very sharp eyes for stuff on military history, strategy and such. Indeed, commanders at all levels have developed reading lists for those under them so that the subordinates can understand where their bosses are coming from. But I would like to suggest one caveat: these folks tend to better when focused on the military and less so when it comes to getting background on where the military will be operating. Lots of stories now, starting with a 60 minutes piece on Greg Mortenson and his Three Cups of Tea book and its limited accuracy. The Chairman of the Joint Chiefs of Staff Mike Mullen was a big fan of this book (although his official reading list did not include this book). I am familiar with this tendency within the military, as the Balkans Branch of the Joint Staff had Balkan Ghosts by Robert Kaplan on its reading list in 2001. Perhaps my greatest contribution during my year on the Joint Staff was getting to revise the list and drop that book. It is exactly the kind of thing that seems attractive to uniformed types--a travelogue with lots of local color, developing a very general (but severely flawed) understanding of the place. So, the lesson du jour for civilian types is discriminate when getting reading suggestions from military folks--do read their recommended stuff on military history and strategy. But don't read their suggestions for the history and cultures of countries, unless you don't mind blowing time on reading stuff that is utter crap. Of course, I cannot say if Cups of Tea is utter crap, but Balkan Ghosts was/is. The lesson du jour for the military types is that they should not buy into the most popular stuff on countries in which they are operating. Just because something is widely cited does not mean it is good or right. A Good Weekend for Ethnic Outbidding? We live in nationalist times. Some of this is clearly economic--that even in good economies, uncertainty feeds the beast of nationalism, but in bad times, nationalist demands may increase as blame is directed at other groups and as the economic costs of pursuing nationalist courses matter less. That is, if the economy is tanking, then there will not be as much additional damage if a government chooses a nationalist course of action. In some places, the incumbents have simply been around too long. Hungary's right of center party, Fidesz, gained enough seats in parliament to re-write its constitution. And it is doing precisely that: "With references to God, Christianity, the Holy Crown of Hungary, fatherland, national pride and traditional families, the text has raised concerns in the Hungarian press and among observers, who see it as discriminatory." France has banned the burqa even though there is hardly a threat of many women wearing it. Just good old symbolic politics. The PQ program itself is chock full of promises to divide Quebec and alienate minorities. Before getting into the language stuff, I want to highlight how much further they want to go than France: obsessed with secularism, the PQ proposes to ban the wearing of any conspicuous symbols, going beyond burqas to include yamulkes, hijabs, etc. Building on an old Jacob Levy argument, perhaps this is clever politics to bring the secularists and the Catholics (since the symbols in play seem not to be Catholic ones) together. To be clear, there is no threat to the secular winners of the Quiet Revolution. There are not hordes of folks clammering for Shariah law to be imposed. In the same vein of responding to non-threats, the PQ reaffirmed its commitment to take the rules for K-11: that French speakers and immigrants cannot go to English public schools and extend that to the CEGEP level (two years of publically funded education in between high school and university) despite the fact that this is very unpopular. It is not clear that these two years will do a better job of creating Francophones (and separatists) than the previous 11 or 12. It almost seems as if the PQ does not want the Quebec young folks from developing the skills to compete in today's international economy. The PQ also "voted to make French “the priority language” before all courts and tribunals in Quebec, including those under federal jurisdiction, and to beef up the province’s language police. In addition to adding language inspectors, a PQ government would mandate them to investigate whether anglophone hospitals and municipalities serve enough anglophones to continue operating in English." SourceI am not even sure that this can happen even if they rely on the notwithstanding clause (the compromise that allows any province [or the federal government] to engage in unconstitutional behavior by simply passing a majority vote). The basic idea, of course, is to provoke as many battles as possible so that Canada says no and so that the Francophones become mobilized enough to support a referendum. I guess this is possible, but since the PQ has made it clear that this is exactly their strategy, I don't think that either Canada or the folks in Quebec will over-react when the PQ over-reaches. All I do know is that it will be disruptive and that the government will end up dumping heaps of $$ down a black hole in pursuit of a nightmare dream that will never happen. But nationalists tend to be self-destructive. Some twitter folks were linking to this piece on Women in Combat this morning, and it reminded me of an earlier post here. While I think the equity argument is an important one--that serving in combat is required for folks to become leaders and if we keep women out of formal combat positions, we are ensuring that they cannot rise that far--my point here is more about modern combat. Because the US is so superior in conventional capabilities, most conflicts down the road will be unconventional ones, which has two effects relevant here. First, the line between combat and non-combat positions is beyond silly at this point. As Vietnam showed and Iraq/Afghanistan reinforced, the distinction between the "front" and the "rear" is largely irrelevant. Women have been in combat for much of these wars. Indeed, even in the opening offensive in Iraq, women were in harm's way as truck drivers and providing other logistical support. The article linked above provides plenty of evidence to support this notion that the only folks who believe there is a separation between combat and non-combat positions are in the US Congress. This parallels the distinction between the International Security Assistance Force and Operation Enduring Freedom--two different missions that cannot really be distinguished except by European legislators imposing restrictions on their contingents. Which gets to the second point: these restrictions in the US military serve as the equivalent of the caveats for which we have been castigating our European allies. We have imposed a restriction on how we deploy (sans women in combat), which matters a great deal, especially in countries where the local women will not talk to foreign men. Our military women not only serve as important role models, but also as important conduits of information from Afghan women to our intel folks. The US Marines have tried various tactics to avoid the US legal restrictions, but it is not easy. Just as in the gays in the military debate, framing this as rights and equity may not be the only way to proceed. We need to remember that women not only can do stuff as well as men, but in some cases are indispensable. Restrictions on their involvement in combat have hurt the war effort. So, the folks who argue against women in combat (ignorant on so many levels) are actually anti-American in that they are advocating that we go to war with fewer weapons at our disposal. UPDATE: Count the Aussies as being ahead of the US curve--just announced decision to allow women to serve in combat units. Anybody feel Prime Minister Harper is using Parliament (being in mid-election campaign) as an excuse to not make difficult decisions about the Libya mission? I immediately responded back that this worked for the Afghanistan mission--that when asked, Harper would always say that he would respect the parliamentary mandate to end the combat mission in Kandahar in 2011. This was almost a non sequitor as the PM could exert some political effort and spend some capital to get the mission renewed as he did in 2008. So, it struck me that Harper views Parliament as the drunk in the old saying views the lampost--for support, not illumination. Harper has been consistent in his inconsistency: Parliament matters and is an important constraint when he wants to be constrained, and it is not when he does not want to be constrained. I don't know much about the powers of the PM, Parliament, the Crown and such stuff, whereas Phil does. His tweets suggest that Harper's consistent inconsistency is not consistent with Canadian laws, conventions or practice. While I don't consistently agree with Phil (as our Sunday morning tweet battles prove), I will consistently concur with him on Harper's drunken view of Parliament. Alan Kuperman's take on the Libya mission is getting a heap of play on the internets: he essentially argues that there was no looming humanitarian catastrophe that US/UK/France and their NATO pals needed to prevent. He blames the rebels for manipulating the outsiders. Had anyone wanted to, they could have written the piece for Kuperman since it is very consistent with his previous writings on Rwanda and elsewhere. The temptation here is to deploy Emerson's quote about foolish consistency, but I have to admit that I tend to see ethnic ties (from my first book) and xenophobia (from my second book) everywhere and perhaps more than they are relevant. Others, especially Jon Western, have done a great job of arguing that there was something there to stop--that is, there was a real risk of a mass killing to prevent. I would only add to that one of the pieces of social science that is relevant: we know that overwhelming victory tends to end civil wars more durably but also more bloodily. That is, when one side wins outright, they tend to engage in large scale killings of their opponents. So, if we abstract away from the particular case, we can still expect that Qadaffi would killed lots of folks had the outsiders not stepped in to prevent the fall of Benghazi. Of course, the title of the piece, pretense, suggests that there is an ulterior motive. While we can speculate about Sarkozy's interests in terms of domestic political strategies (wag the chien),* for the US and UK, the domestic gains are less obvious. If one wants to say anything about oil, the reality is that the old strategy has always been the best one for cheap oil--support the autocrat. Indeed, one of the problems in the Marxist-type arguments about resources and intervention is that outsiders usually can get resources from the regime or its opponents, so it is often not so obvious that supporting the rebels is the best way to get the resources. Given that US relations were at the best with Qaddafi before this wave of dissent and repression, it is hard to say that Obama needed to support the rebels due to a thirst for Libya's oil. The Europeans could be more concerned about access to Q's oil, but again it is not clear why supporting the rebels would be the way to go. * See Roger Cohen's piece that puts France and Germany into perspective. And this is here I only partially embrace my own foolish consistency. I do think that some of the motivation here is immigration prevention--xenophobia. But I recognize that the interventions of many are motivated and/or justified by the real concern about watching dissidents get killed. What Kuperman fails to highlight is that Qaddafi's opponents did not start by fighting but with protesting. They fought back after getting shot at. No small distinction there. Again, I am contradicting my own earlier work by suggesting something was contagious here. The decisions to support the Libyan rebels are linked to the positions taken by Obama and others with regard to Tunisia and Egypt (and even Bahrain, sort of). You can still can play poker online. Yep, the US has now arrested some folks who run the major online sites (Pokerstars, Full Tilt) and blocked their URL's. Good to know the morals of America are protected from gambling. Oh, states are proposing online poker within their boundaries? To raise money in a time of difficult budgets? Huh. It would make sense for the feds to do that, too, but we have to appease the social conservatives since gambling is a sin. What is next? Dancing? Where is Wren when you need him? It is time for this debate over NATO’s viability to take place. While NATO may serve as an institutional reminder of the shared democratic values of the Atlantic community (and NATO’s not-so-Atlantic new members) and help with interoperability between its members’ military forces, the Alliance, in its current form, has proven it cannot lead and execute complex, sustained operations in today’s world. Three strikes in the Balkans, Afghanistan, and now Libya may not be enough to put NATO out of business, but it certainly should be enough to place the question of its value on the table. He rightly points out many of the problems when NATO is involved in an operation--conflicting goals, restrictions on the troops (my fave topic of caveats), and so on. However, while I have raised many questions about the limits of NATO in my blog and in work underway, the question is really not NATO or not but NATO versus what else? That is, we need to consider what we expect NATO to do, whether it meets, exceeds or falls short of our reasonable expectations, and what would replace it. I missed the second debate because I was being feted by the warm folks at Grove City College. Plus my French is not up to understanding complex stuff like misunderstanding the UN. Apparently, the Liberal Prime Minister candidate and author on nationalism took a strong initial stand on the deployment of Canadian Forces: only with a UN resolution. Someone apparently pointed out what I always point out to my students--if you want your foreign policy subject to Chinese and Russian vetoes, then sure, a UN Security Resolution can be a fine requirement for your deployment decisions. But if by some chance you don't think that Russia or China should have a veto on your foreign policy, you may want to hedge a bit about using the UNSC as a requirement. Iggy figured that out by the end of the debate. Too bad he had not spent much of his life hanging out with skeptical political science types. Oh, he has? So, he has a learning curve but it is mighty shallow? As I said before, figuring out the least bad choice is pretty hard, and Iggy is making it harder still. ICTY--the International Criminal Tribunal on Yugoslavia--just handed down some key verdicts sentencing a couple of Croatian generals to significant jail terms and directly implicating Franjo Tudjman in the ethnic cleansing of Serbs from Krajina. There were not too many good guys in the disintegration of Yugoslavia. For instance, the Slovenes did not engage in much violence, but must have known that their separatist effort would help to de-stabilize the rest of the country. The conflict empowered the criminals in most of the successor states since they were the ones who could move the goods past the embargoes. But the folks who were most responsible for the wars were the leaders of Croatia and Serbia--especially Tudjman and Milosevic. The former died before being tried, the latter while the trial was underway. Their dueling irredentists--Croatia seeking parts of Bosnia, Serbia seeking parts of both Croatia and Bosnia--fueled the conflict. Milosevic's nationalism was pretty clearly opportunistic while Tudjman's was sincere. The latter's entire career was focused on the Croatian nation. I don't have definitive proof, but it has always been my suspicion that Serbia's ethnic cleansing was more tactical than strategic while Croatia's was much more strategic. That is, Serbia kicked other groups out of conquered territories so that they could hold them, but perhaps Croatian folks were generally pursuing a more ethnically homogeneous Croatia. Perhaps someone can dig through the documents filed at ICTY to ascertain how ad hoc vs how planned these efforts were. Of course, the folks on the ground will blame the "Others" no matter what. Will this erode Tudjman's place in Croatian history? Probably not that much, but scholars are working on the issue of whether these tribunals really change attitudes. Certainly, this case will get another look. For the outsiders, we need to remember that there can be bad guys on both sides, a lesson that is quite relevant today in Libya. The Brits had a game show that seems to be the inspiration for a similar US game show that plays out Prisoners' Dilemma. The beautiful woman, Liv Boeree, is now known as one of the better poker players at the various tourneys. Yep, the heartless, bluffing, brutal skills of PD translate well to the poker table. Who would have thunk it? Of course, one could ponder why the guy got suckered, and if her good looks played a role or not. I leave that to my readers. I just enjoy watching social science that is sold to the public as entertainment/reality TV. It is that time of year--when high seniors have to decide what to do. And this is when parents* have to figure out what they can afford. The NYT has been covering the entire process with the latest entry on figuring out what to do when one has a choice. * This applies to the US. In Canada, there is not the same kind of cultural expectation that parents pay for the kids' university education. But it ignores the big question--what is really worth paying for? Is there a qualitative difference between schools that justify spending thousands, tens of thousands, more dollars? A follower of this blog asked me to consider this process. Believe me, I am, both because I am concerned about the "business model" of my profession and as a parent of a high school student. For me, the big question is of size: do I want my kid to go to a large research school, like the places where I have taught, or a small liberal arts college, like where my wife and I went? And does a potential cost difference overwhelm the benefits of going small? I think one can get a good education at a large school especially if one wants to get into a specialized kind of major that is not offered at a smaller school, but that the students are better off in a smaller school on average where they can actually get to know the profs and the students are viewed less as an inconvenience for the profs. I am sure my life would have turned out fine if I had gone to a bigger, public school such as Penn State, although I would not have met this particular wife. * But my experience would not have been as positive, I think. I would not have known the profs, they would not have known me. I would not have gotten the advice I would have used to choose my next steps, and I may have been turned off from this business of profess-ing. I didn't end up doing what the folks I admired did--I didn't end up at a small school, but I have come close enough. But that was the market at work, not my original intentions. * Thus, I prefer the choices I made. And the ones my parents could help me with. Of course, I am over-simplifying as there are many big schools that are just as expensive as the small ones. For those, the differences in benefits still exist, but I do have a harder time justifying the expense of additional $100,000 or more over four years. I do think that the university education is an incredibly important investment, but the prices have gotten so high I am not sure that the debt associated with the highest quality is worth it. In my mind, the size variable is the key. We will see what I am compelled to do in a couple of years, because it will be my daughter's preferences that matter the most. I owe her the education that best suits her. And it will be her life and thus hers to choose. This is hardly surprising. Well, it may be surprising that the Dutch are there at all, given that their sweeping defense cuts will be eliminating all of their tanks. Perhaps their participation here is partly aimed at justifying to the home crowd the need to keep their current planes (or at least most of them) and invest in the next generation of planes (F-35's). It should not be surprising that there is a division of labor/responsibility where some countries are willing to engage in striking targets on the ground while others refrain, enforcing only the No Fly Zone. This has much to do with domestic politics and how these dynamics interact with the various meanings attached to the UN resolutions. The Danes are keen to support NATO, especially with their former Prime Minister running NATO. France is demonstrating quite clearly that caveats are a matter of Presidential interest or disinterest. They were in the club of rations consumers (as opposed to burden bearers) in Afghanistan under Chirac, but Sarkozy has been pushing French participation in NATO since then. Regarding the British, coalition government does not seem to be restraining its foreign policy as some (that would be my co-author and I) would have expected. Will have to think more about this case. The debate about the pace of bombing reflects a bit about how countries have different rules of engagement--some are far more willing to risk collateral damage while others are not. Some countries are eager to participate symbolically in a NATO mission, any and all NATO missions, but not engage in any kind of effort that would be controversial. One of the amazing things is how many countries are participating at a time of steep budget cuts. Folks say that NATO does not matter or is entirely ineffective, but it does have a big impact of maxing pressures to participate at some level. That is, NATO members tend to feel obligated to participate plus domestic audiences are more likely to expect their country to participate in a NATO operation. On average, it is almost certainly harder to get domestic support for ad hoc missions than for NATO ops. So, NATO does matter, even if it is not effective as folks would like. Am I surprised that countries disagree about the pace of the operation? No. Anytime there is more than one actor, there will be differences about how an operation is conducted. Seems that the Chinese are banning work on time travel. Ok, they are banning tv shows and movies that depict time travel, but isn't this the first step towards fostering ignorance in this area of research? This could be just the break the US needs in the economic and security competition down the road. Perhaps rather than being miffed at the Lost finale as the Gawker post suggests, maybe the Chinese are just miffed that the Indians are viewed pretty favorably? Namaste! At Disney, you are supposed to choose to be a Jedi, not a Sith. Perhaps too much Fox News in this kid's household. Sesquicentennial Celebrations: Happy Civil War Everyone! Today marks the 150th anniversary of the beginning of the bloodiest war in American history. It can be called many things: the American Civil War, the War Between the States, the War of Northern Aggression,etc. But one thing stands out--the right side won. While folks can claim that the war was not about slavery, but they would be wrong. The Southerners chose to secede because Abraham Lincoln was elected, and it was not his anti-state's right position that caused such a reaction--it was the key issue of the day that defined the state's rights/federal government's responsibilities debate--slavery. I am no expert on the Civil War, but we have seen over the past year here and elsewhere posts about the origins of the war that make it mighty clear why there was a war. Of course, individuals chose sides for all kinds of reasons that may or may not have related to the master narrative about slavery, but the war had a very clear outcome, one that the Southerners had fought to prevent: the end of slavery. The war did not solve America's race problems nor did it resolve the debate about state's rights (except to rule out secession). Today, we still have a debate about what is the proper role of the federal government, with Southern states mostly lined up against the federal government. Red vs. blue does not strictly correlate with Blue and Gray, but it damn near does. Wouldn't it be cool if we could just not have all of those right wing voters and politicians that skew our political systems? Sure, secession of the South today would be mighty cool since I no longer live in Texas. But history is just a bit path dependent. So, one could ask whether the war was worth it? Well, that is a neat academic question, but given that there were people living and dying in chains, the question is hardly academic at all. Sure, it took another hundred years to realize some of the promises made during and after the war (13th, 14th, 15 amendments) via the civil rights acts, the federal government using troops to integrate high schools and universities, the movement led by Martin Luther King Jr. and so on. And, yes, many African-Americans live behind bars today as our war on drugs has been carried out in a way that is quite unjust. But it took a great deal of bloodshed to address America's original sin, and slavery is such an abomination that, yes, it was worth it. We will certainly spend the next four years re-visiting the war, which will provide ample opportunity for revisionists to try to gloss over this very central point. But the words of past Presidents and the current one about "a more perfect union" have at their core the notion that we started flawed, but not fatally so. That we overcame slavery, that we overcame much (although not all) oppression due to race, religion, gender, and sexuality, but there is much left to do. Remembering where we started, how far we got, and what it cost might not be a bad way to spend the next four years. One of the stories that was most revealing during my time on the Joint Staff was the Rummy effort to get US units out of everywhere. Because I was essentially a free hand, my bosses had me do the initial draft of a response to a Rumsfeld request to get US forces out of all of the various commitments around the world. So, I basically coordinated with the various JS folks responsible for all of these missions. Once I wrote the response, it went up the chain with various micro-editing along the way, but then it got kicked back down. Why? Because Iceland had not been on the list. Who wanted it on the list? The US Air Force 2 star who was a couple of rungs up the chain. Why? Because the US had a small detachment of fighter planes (F15s's and or F16s) that represented the US and NATO commitment to the defense of Iceland. * Why would this be problematic? Well, it was not so much the fighters, which the US had in abundance, but the need to deploy refueling aircraft and long-range search and rescue units (helos). These were quite scarce, particularly as Afghanistan was heating up (fall 2001). * It is important to note that Tom Clancy's fantasy of WWIII, Red Storm Rising, turn entirely on Iceland due to a game he had been playing. The problem was that Iceland didn't want to see the fighters go away since that was their only defense. So, they threatened to kick out the US naval forces that used Iceland as a base for detecting submarines in the North Atlantic. Ooops. So, the memo did go up with the inclusion of Iceland on the list, but I always wondered what became of it. Well, now I know. Instead of being a US commitment, it is now a NATO commitment to send planes occasionally to fly over and around Iceland (update: see here for CEFCOM info on the mission). The current shift belongs to: Canada!! And this was a bit more complex this time since the unit initially slated to go to Iceland is now flying over Libya. This is interesting to me partly because of the nostalgia for one of the snowflakes that kept me busy during my year in the Pentagon (Rummy kept asking the same question). But it also shows some interesting bureaucratic politics (USAF pushing the change, one of the few instances where service seemed to challenge the Joint atmosphere of the JS); alliance politics (could not offend the tiny Icelandic folk); Rummy's unilateral obsession and so on. Good times! No! Please Stop!!! I am catching up on stuff I need to read--articles to review for journals, MA papers that need comments, and dissertation chapters. * The most painful part is reading the obligatory review of the literature. Part of the academic ritual is to show that one has read the stuff in the field: to please one's advisers to show them that you know what others have said; to please journal article reviewers so that their own work is cited and not slighted; and to put the question/answer at hand in context. The funny thing is that if one focuses on the last, one should be in good shape. * My PhD students have largely learned to avoid subjecting me to these reviews as I have given them heaps of painful feedback over the years. The post today is due to the other two categories of folks. So, the tendency is to label a section of a chapter or an article "Literature Review" which, for all intents and purposes can be read as "Beware, here lies boring and largely irrelevant stuff." There are two ways to write this stuff (well, more than two, but why not dichotomize wherever one can): list a heap of stuff written in the field; or discuss why previous work is insufficient and how one is building one's argument by relying on the various arguments made by others. If the latter, then name the section or sections more descriptively. If you cannot cut all the literature that you think is tangential to your argument, put it in the footnotes. Saideman's rule number one for writing--just because you read something or learned something does not mean it is relevant. Saideman's rule number two--edit before submitting to Steve or anyone else. The problem is that if you bury your argument in a heap of lit review, the person reading it might not be able to find the argument or care that much when he/she does because the attention will be focused on the heap of extraneous literature and not on the logic of the argument. Of course, I have written crappy lit reviews and some of them have even gotten published. Students should read stuff in the field not just to get the arguments, but figure out what styles of writing work best. If nearly every piece in a journal has a "literature review" sub-heading, then ignore my plea and follow the model for that journal. Read the best articles that review literatures (Annual Review of Political Science has many good ones) or heaps of pieces written by Jack Levy (like this one or this one). ** That is a joke. For jokes, see Marx, G. (1939). Ok, to be fair, not all of these happened. Just nearly all of them. Turkey, Iran or Israel? Check with a major empowering of Iran. No WMD used against US or allied foces. Nope. Of course, they didn't have any. Iraq descends into Anarchy? Double check. Iraq becomes balkanized? You mean, ethnic cleansing and clear dividing lines between the ethnic groups? Check. POW crisis? Oh my goodness, yes. Saddam using WMD against rebels? Um, real WMD fixation here for 2004 when we knew there were no WMDs. Widespread vigilante justice? Well, stuff happens, right Rummy? Just some stunning stuff in ye old archives. * Note--I don't think this applied to the 2008 election where Obama was actually a good candidate that people could, ahem, prefer. He was not the hold your nose candidate that John Kerry was, for instance. But, in some ways, the Americans are kind of lucky. I was asked recently by someone who I would vote for in the current Canadian campaign, and I responded that I was glad that I could not (I am not a citizen, just a resident). * Why? Because I would have four or five candidates to choose from and picking the least worst is much harder. * Another advantage--I was able to turn away a couple of Conservative folks who appeared at my door--sorry, I cannot vote, go away. We can include the Greens, but that would be an entirely wasted vote. They have not gained any seats in parliament as far as I can tell. The Bloc Quebecois: If you follow this blog, you know how I feel about Quebec separatism (they call it sovereignty, but who are they kidding? Only themselves if they think it works). Quebeckers will argue that voting Bloc gives Quebec sway in Ottawa. Sure. But as a spoiler since a successful bloc means no party gaining a majority, which might be fine. But since the BQ will not be in power under most potential realities, it is voting for a party that can only extort. For me, any vote for a party that promises secession is, well, voting for secession. That would be against my interests as an Anglophone in Quebec, and against Canada's interests and Quebec's as well, since another referendum, successful or not, will disrupt the economy and produce much animosity. The Conservatives? Um, what do they stand for? Not for the missions in Afghanistan--that would require standing up. For a variety of relatively right wing positions such as banning the registry of long guns (rifles, I guess). Not to mention that Harper has not been the most open, transparent, accountable of Prime Ministers. That the PM's Office writes the talking points of most/all government officials is perhaps even more problematic than stamping Harper government all over the place. The New Democratic Party [NDP]? Jack Layton is clearly the most "Prime Ministerial" of all of the party leaders, and is fighting a good fight despite fighting another fight--cancer. I do admire the man. The party, well, not so much. Not only do you have candidates talking about the "American war machine" in the context of the F35 debate (I don't mind opposing the US, just 1960's era mindless jargon), but the party's pacifism is not a stand I can support. More importantly, the party, which would seem to be for rights and freedom, always panders to the French nationalists within Quebec, siding with them when various issues come up where the NDP can support oppressing the Anglophones. They seem to be the only Federalist party using only French signs in Quebec. Their hypocrisy here bothers me far more than the other parties for some reason. I guess I am always annoyed when the self-righteous are so very wrong. But they are a party of panderers, as their latest promise to freeze tuition suggests. First, the Federal government here has no role to play on tuition since that is a provincial matter. Second, given how much the provinces vary in their tuition (it is still low across the board), there is nothing to this platform promise but a play to the young who may not understand math. Which leaves us the Liberals. Their leader, Michael Ignatieff, makes everyone believe the old saying: those who cannot, teach. Iggy just lack any credibility to be a decent Prime Minister. I am still frustrated that the Liberals ran away from the Afghanistan mission when they were the ones that started it. Their platform calls for more peacekeeping and less war-fighting. I really do not want to see the day that Canadian Forces are deployed again in a peace-keeping mission because the public and the Liberals will be upset when folks shoot at the CF whether they are wearing blue helmets or not. The world changed after Somalia and Rwanda and one of those changes is that the opponents in these kinds of missions will fire upon the folks from the international community to drive them away. If you are not prepared for that, then don't deceive everybody into thinking that it will be the 1960's all over again. So, I am glad that I can watch the train wreck that is this election. I am firmly convinced that the Canadians have become more American than they could possibly imagine/tolerate. Just as Americans have grown to prefer divided government (Presidency and Congress controlled by different parties), I think Canadians have come to prefer minority government. At least, the way they vote this time is going to appear to support that belief. Several more years of a Conservative minority government are ahead of us, while Iggy returns to the academy. My hope is that the Liberals find themselves a better leader. I am not counting on it, but that is my hope.